Aldersgate Hymn Festival 2007: Let the music begin! The MSM Ringers leading a procession down the aisle, handbells chiming the start of the Hymn Festival. 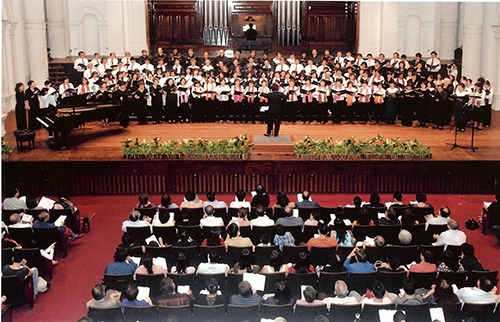 THE Aldersgate Hymn Festival, a jubilee of Wesleyan poetry and song, thrilled a thousand tongues and ears at Victoria Concert Hall on May 20, 2007. The worshippers gathered and joined the choiring angels above to enjoy an evening of familiar hymn staples and newly-commissioned Asian anthems, all with a single theme; for all texts sung and proclaimed throughout the evening were composed by Charles Wesley, whose tercentenary the festival celebrated. 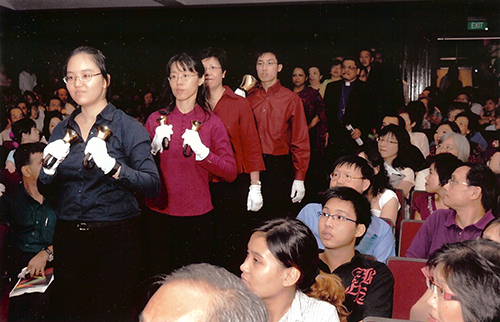 The Hymn Festival, organised by the Methodist School of Music (MSM), started out with the MSM Ringers leading a procession down the aisle, the handbells chiming the start of the event. Various choirs then took their turns on stage, expressing fervent piety in tunes ancient, modern, and Asian. 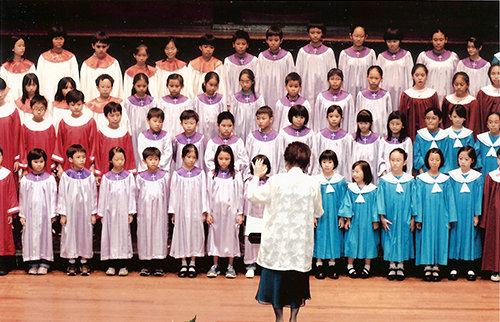 These included a range of Methodist and Ecumenical choirs: the MSM and Methodist Girls’ School choirs, a combined children’s choir, the Celebration Chorus, as well as choirs from the various churches from Trinity Annual Conference, the Chinese Annual Conference and Emmanuel Tamil Annual Conference. The commissioned works* drew on the rich musical ethnic heritage of the many countries and peoples on which the Wesleyan faith has had an influence. They were joyful rhythms from the Philippines and Indonesia, as well as melodies from Taiwan, all this in addition to our very own delightful local harmonies. Our faith is a universal faith, our tradition a cosmopolitan tradition, and our music an international heritage, and nowhere was that more obvious than in the diversity of music that was present there that evening. Surely this was but a foretaste of what is to come, where every tribe, every tongue and every people will spend an eternity worshipping and adoring our crucified, risen, and ascended Lord in their diverse and ethnic traditions. As each one of us left the hall that evening, inspired and uplifted, we felt that somehow, our hearts were “strangely warmed”. 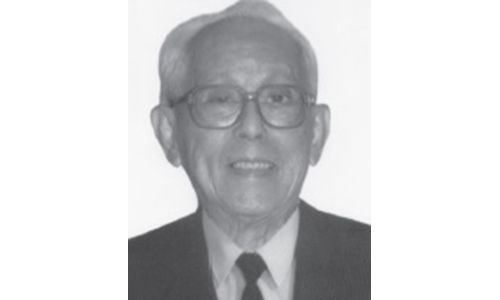 Victor Li is an organ student at the Methodist School of Music. 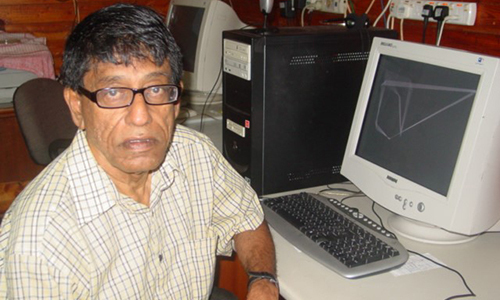 He worships and serves at Barker Road Methodist Church and Telok Ayer Chinese Methodist Church (TA 2). The Combined Children’s Choir under the direction of Ms Mary Gan, Principal of the Methodist School of Music. 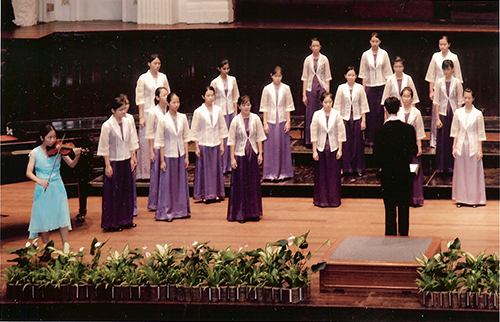 Violinist Rachel Chua accompanying the Methodist Girls’ School Choir, which was under the direction of Mr Albert Tay. *The MSM Choral Series, comprising works by composers Lu Cheng Tiong, Lim Swee Hong, So Heng, Chan Hung Da, Joy Nilo, Mary Tan, Jusuf Kam, is available for sale ($20 a copy) at the Methodist School of Music. 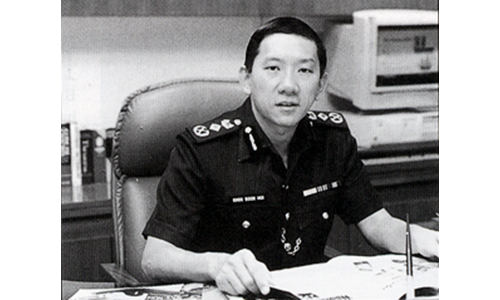 Please call Chet Wei at 6767-5258 to order.